TAMPA, Fla. — Connor McDavid wanted to go stride-for-stride with Dylan Larkin to set the NHL’s Fastest Skater record straight once and for all. Larkin said in November he “absolutely” would go toe-to-toe with McDavid. But with Mike Green selected as the Detroit Red Wings’ lone All-Star representative, the NHL had a tough time filling out the field to challenge McDavid in Saturday night’s All-Star Skills Competition. Multiple veterans pulled rank and turned down the invite to participate in the event because they didn’t think they stood a chance against McDavid. Facing a group of seven other young players - including five first-time All-Stars - McDavid became the first player to ever win the NHL’s Fastest Skater competition in back-to-back years. McDavid, 21, circled the ice in 13.454 seconds to narrowly edge Tampa Bay Lightning hometown favourite Brayden Point’s 13.579 seconds. "I kind of stumbled off the start, almost toe-picked and face-planted, so that didn't help," McDavid said. "I didn't feel too good about it, thought it might be a loss. You just try and skate as fast as you can. It worked out well." It was slightly slower than McDavid’s winning time of 13.310 seconds in Los Angeles last year. But five of the eight participants on Saturday were north of 14 seconds. The NHL’s youngest $100 million man took home $25,000 for his lap. Not bad for 13 seconds of work. Larkin, of course, set the NHL’s Fastest Skate record in 2016 in Nashville with a time of 13.172 seconds, but it holds an asterisk because that year was the only year of the annual competition which allowed players a flying start from the blue line. 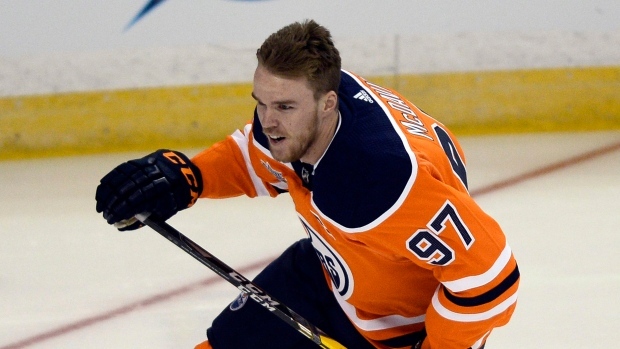 “No one’s ever going to beat that,” McDavid told TSN last November. McDavid’s blazing speed captivated a capacity crowd at Amalie Arena, with the NHL’s best team through the first half of the season hosting All-Star weekend for the first time since 1999. They treated one of the NHL’s most inspirational stories right when New Jersey Devils forward Brian Boyle, who was diagnosed with leukemia in October, with some of the loudest ovations of the night. “It’s kind of a pinch-me moment,” Boyle said before the Skills. As usual, All-Star Saturday Night offered a chance for some of hockey’s brightest stars to showcase not only their skills but some of their personalities. Golden Knights goaltender Marc-Andre Fleury hilariously chose hit song “Let It Go” from Disney movie Frozen as the anthem to his run in net for the new Save Streak breakaway competition. It must’ve worked - Fleury one-upped Nashville’s Pekka Rinne by making 14 straight saves. Reigning Norris Trophy winner Drew Doughty nearly gave up in the difficult Passing Challenge, which integrated new technology. Blues defenceman Alex Pietrangelo was tops in that event with a time of 46 seconds. Senators captain Erik Karlsson drew laughs when he actually picked the puck up with his glove to put it on his stick in the Puck Control Relay. Flames forward Johnny Gaudreau won it with a time of 24 seconds. Alex Ovechkin slapped home the Hardest Shot with a fist-pump and a roar at 101.3 mph, becoming the first forward to win the contest since fellow Russian and former teammate Sergei Fedorov did it in 2002. Canucks rookie Brock Boeser capped off the night by hitting all five lighted targets in the Accuracy Shooting with a winning time of 11.136 seconds.